The center-of-attention in American family homes has been the television for many decades. When thinking about a remodel, a custom storage and entertainment center is the perfect way to showcase the new flat screen with style and functionality. Start your planning by deciding on what and how many items you will be displaying. 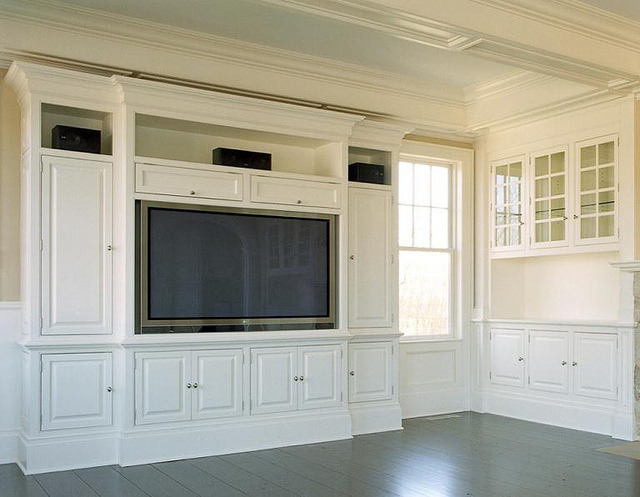 Think about current and/or future time frames in order to map out the right amount of cabinet space for electronics, cables, and proper ventilation. Are you interested in disguising everything? Closing off the television and hiding unused items with a pair of beautifully finished doors can turn the room into something more formal from an everyday space if desired. It creates a clean slate and changes the focal point of the room. Make goodies like DVDâ€™s, CDâ€™s, controllers, and books easily accessible to everyone. Store toys near the bottom and breakables on the top. Providing options such as see-through doors, deep drawers and wide shelves make cleanup a simple task. Safety comes first with an organized cabinet system for cables and connections that keeps them out of sight. Prevent kids and pets from harm and de-clutter at the same time. Lastly, make your entertainment center appealing to the eye.Â Mix and match different finishes and patterns with a variety of drawers, shelves, baskets and areas for hanging. What youâ€™re looking for will stand out in a stylish fashion.